Last Updated: March 19, 2019 · Published: January 31, 2017 By: Asian Caucasian 1 Comment This post may contain affiliate links or sponsored content. 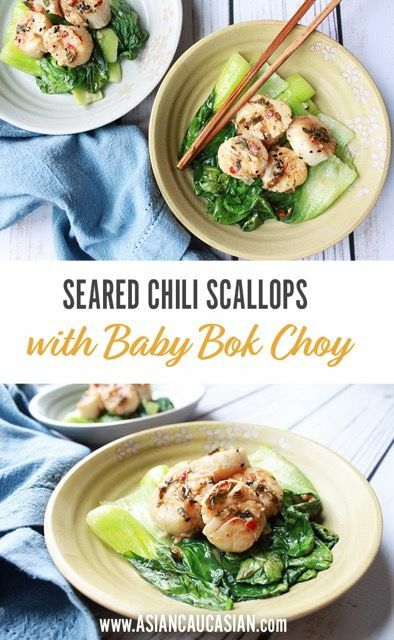 This sweet, tender Seared Chili Scallops recipe is a dish I could eat once a week! Honestly, it’s incredibly easy and so impressive when plated! Scallops are quick-cooking, tender, and mild, and go well over just about any vegetable or grain. We plopped them on top of quickly wilted baby bok choy. The colors are just beautiful from the fresh basil and mint, and the pop of color and heat from the Thai chili peppers. Did I mention how low-fat this recipe is? No guilt! Just some Asian persuasion from our end! 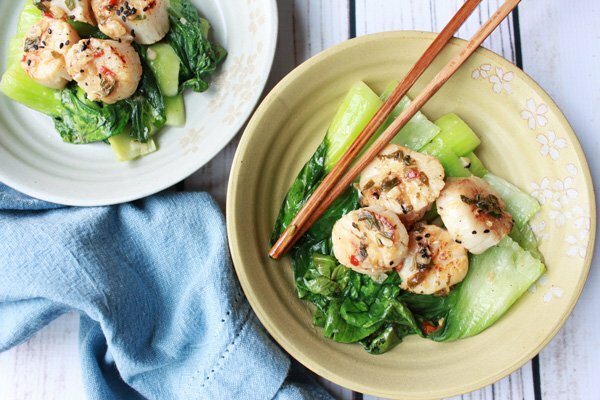 Quickly wilted baby bok choy is deliciously paired with the seared scallops! Sweet and succulent fresh sea scallops are the star of this dish! In a medium glass bowl, whisk together 1 tablespoon canola oil, garlic, chili pepper, lemon juice and zest, orange zest, basil, mint, salt and pepper. Add the cleaned scallops to the bowl and let marinate for 15 minutes at room temperature. Remove the scallops and pat dry, reserving the marinade. Heat a heavy skillet over high heat. Add the other tablespoon to the pan. Sear the scallops until just done, about 2 minutes on each side. Remove from the pan and keep warm. Place the reserved marinade in a small sauce pan. Bring to a boil and lower to a simmer, keeping marinade warm. Heat the same heavy skillet over medium high heat, with 2 tablespoons canola oil. Quickly wilt the baby bok choy in the skillet, adding salt and pepper to taste (optional). 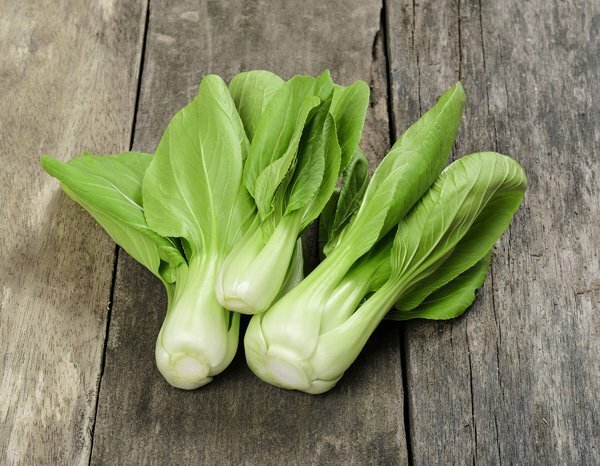 To plate, place several leaves of bok choy at the bottom of a dish. 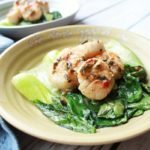 Top bok choy with the scallops and marinade. Sprinkle more basil and mint to garnish if desired. Serve immediately. So much flavor in this dish, yet it comes together so quickly! Can’t wait to make it!